Last night our giveaway that was sponsored by Over the Moon Milk closed so we have 3 new winners to announce this afternoon. 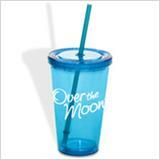 Each winner will receive a new sipper cup, lid and straw from the great folks over at Over the Moon Milk. Our 3 winners for this giveaway were chosen by Random.org and all 3 of them have been emailed. They will have 48 hours to respond to the email I sent before new winners are chosen. Congrats to all 3 of our winners! You will find our current giveaways listed in the right side bar and 3 more giveaways are coming early next week. Thanks for reading the Shakin and Bakin Foodie Blog and for entering the giveaways sponsored here.